I recently was fortunate to observe Tim Sandefur argue the unconstitutionality of Obamacare in the District of Colombia Court of Appeals under the Origination Clause.1 Following the arguments a symposium on the Origination Clause was held at the Cato Institute. After the symposium I met Mr. Sandefur and was introduced to his new book, The Conscience of the Constitution: The Declaration of Independence and the Right to Liberty. Crucial to appreciating the import of Conscience of the Constitution is the introduction’s Lincoln parable on the meaning of “liberty”.2 The parable’s two incompatible definitions of “liberty” define the ongoing constitutional battle in modern America. One view of liberty is a person’s right to do with as one wishes with the fruits of one’s own labor, the other is a right to do as one wishes with the fruits of another’s labor. The natural law view of the equality of men recognizes a right in every individual to chart their own destiny. The other view creates a constitutional value of democracy simply because a majority can exercise power. Mr. Sandefur points out that the country has wrongly come to be dominated by the view that majorities can rule simply because they are majorities. “Liberty” as the freedom to do with the product of one’s own labors as one pleases is the crucial value of the Declaration of Independence3 and ultimately expressed in the Constitution through the constitutional controls on a political majority.4 The Declaration and the Constitution both demonstrate the Founders distrust of “democracy”. Over the last 100 years, “democracy” has been elevated to a constitutional value not simply on a par with liberty, but as the prime constitutional value although it was never intended to be such. Mr. Sandefur makes the point that The Declaration of the Independence is more than a political document, but actually a legal document that created the United States of America and legally separated the colonies from England. As such it is an important factor in constitutional interpretation. The Natural Law values expressed in the Declaration are a legal element of the Constitution. It was the inspiration for the 14th Amendment as the ultimate inclusion of the Declaration’s inalienable right to liberty. 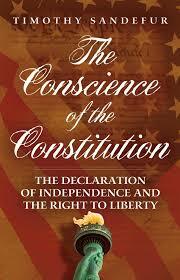 This is the Constitution’s “Conscience” Mr. Sandefur to which Mr. Sandefur refers. 1 In Sissel v. Sebelius, one of three pending challenges to Obamacare based upon the Origination Clause. 2 From Lincoln’s April 18, 1864 speech in Baltimore: “The world has never had a good definition of the word liberty, and the American people, just now, are much in want of one. We all declare for liberty; but in using the same word we do not all mean the same thing. With some the word liberty may mean for each man to do as he pleases with himself, and the product of his labor; while with others the same word may mean for some men to do as they please with other men, and the product of other men’s labor. Here are two, not only different, but incompatible things, called by the same name—liberty. And it follows that each of the things is, by the respective parties, called by two different and incompatible names—liberty and tyranny. 4The controls to limit the power of a democratic majority are many and intricate, ranging from separation of powers to the divided sovereignty of federalism.